Choosing the correct type of roofing can prevent you from dealing with damages and repair costs later on. When choosing between fiberglass and organic asphalt roofing, you should consider the weather conditions in your area, such as high rainfalls or significant wind or heat, and you should consider visual appeal, cost, styles and warranties available. 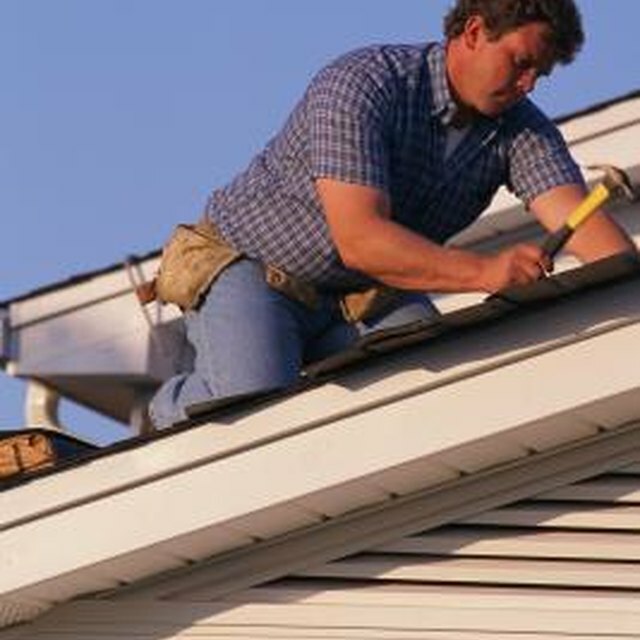 Choosing the correct type of roofing now will prevent damage down the road. Both organic shingles and fiberglass shingles fall under the category of asphalt roofing. According to AsphaltRoofingcom, asphalt is the leading choice for residential roofs because of its durability and versatility. Four out of five homes are roofed with asphalt shingles in the United States. As the most common type of roofing, asphalt shingles come in numerous styles, including organic-based and fiberglass-based shingles. Both types include an asphalt coating and weather-resistant mineral granules. Organic asphalt is heavier and more rugged than fiberglass shingles, because the mat is made with various cellulose fibers, such as felt, wood or recycled waste paper. Organic shingles are softer and more flexible than fiberglass shingles, making them easier to work with when applying them to the roof. Because they are thicker, they are more tear resistant, and they can hide imperfections on the roof. However, organic asphalt shingles tend to absorb more water than fiberglass shingles and can deform over time. Fiberglass shingles use a backing that is made entirely of glass fibers of varying lengths. These shingles are thinner and lighter than organic asphalt shingles, making them easier to carry up a ladder before applying them to the roof. Because fiberglass shingles are known for a higher fire resistance than asphalt shingles, the warranties usually last longer for this type of roofing. These shingles are also more resistant to water, heat and deformation. Both types of shingles must comply with building inspection standards. The prices of each type of roofing are also similar, ranging from $25 to $80 per square, according to HomeAdditionPluscom. Both types are available in 3-tab shingles, strip shingles and architectural shingles, with architectural shingles costing more to buy but less to install because they are easier to install; they also have longer warranties. According to EverettRoofBrokerscom, the common practice of roofing manufacturers and contractors is to promote fiberglass roofing over traditional asphalt roofing because it comes with longer warranties. However, according to this site, warranties are marketing tools that don't provide proof that the roofing will last as long as the warranty. According to JackFlynnAndSonscom, organic asphalt shingles are better for windy and cold northern regions, fiberglass asphalt shingles are better for hot southern regions, and both work well in central regions.